There are two kinds of 'Black hole' thought to exist according to modern theories. The first is a remnant of a dead star and the other is known as a Super Massive Black Hole. First let us consider how a normal black hole can form. There are thought to be two ways, both associated with the death of a large star. Ordinary stars like our Sun are about the middle size in the range of sizes that stars can achieve. Some are up to a hundred times smaller (less massive) than the Sun others may be up to a hundred times more massive. The smallest stars last for a very long time because they use their fuel, the gas Hydrogen, very slowly. When their fuel is used up, after perhaps 100 billion years they will gradually become cooler and eventually 'switch off'. Stars the size of our Sun finish the lives after about 10 billion years in a more spectacular way. Stars under about 3 solar masses in size finish their active cycle in a more spectacular way than the smaller stars. In about another 5 billion years, when our Sun is about 10 billion years old, it will have used up most of its Hydrogen fuel and the waste product, Helium, will have built up in the centre. The fusion (or burning) of Hydrogen will have continued for a long time around the boarder between the Hydrogen and Helium. As progressively more of the mass of the Star is moved inside the fusion zone the radiation flux becomes stronger than the force of gravity exerted by the outer gas layer. This outer gas layer then begins to inflate and expand. As the outer surface of the Star expands the radiated energy of the fusion furnace is distributed over a much greater area and will become cooler. The surface temperature falls from about 6500ºC to about 3000ºC and the star becomes a Red Giant. Eventually the outer shell is blown off into space. With the loss of mass the pressure at the fusion zone is reduced until reactions break down and 'the fire goes out'. The Sun will then contract under its own gravity and become a White Dwarf, shining only due to the heat produced by friction caused by the contraction. Eventually it will cool into a cold dense black dwarf. 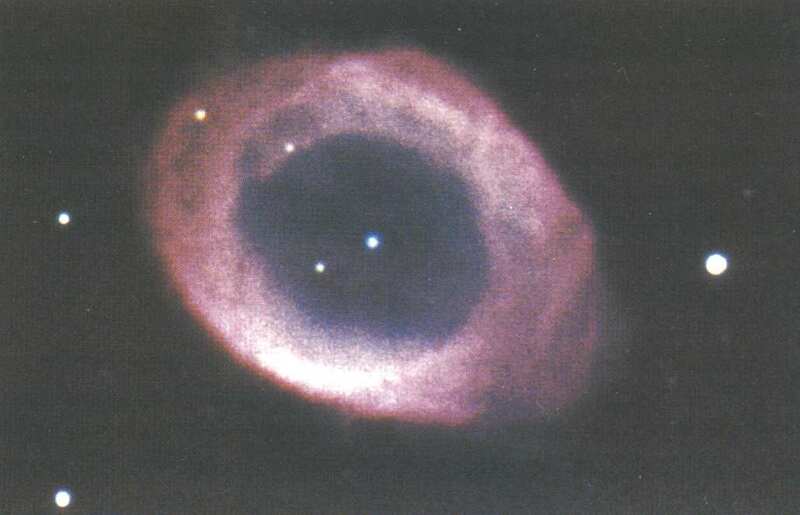 The shell blown off becomes a planetary nebula like the M57 Ring Nebula in Lyra. Heavyweight stars have a much more dramatic end as astronomers in the southern hemisphere saw in 1987. A star previously visible only through a powerful telescope suddenly exploded and shone so brightly that it was easily visible to the naked eye. The star had died as a supernova. The build-up to a supernova starts after a heavy star has lived out its main sequence of life. The star will have used up much of its supply of hydrogen and produced a compact core of Helium. This, however is not the end of the story. In the middle of such a massive star, the pressure and temperature keep on rising until helium atoms begin to fuse into a heavier element, carbon. This reaction produces extra energy to keep the star shining. Eventually, the increasing temperature and pressure fuses the carbon into even heavier elements such as neon, silicon, and eventually iron. At this point, the star's core is like an onion, with concentric layers (from the inside out) of iron, silicon, neon, carbon, helium and hydrogen. This process cannot carry on indefinitely. In the fusion of iron nuclei, the reaction does not produce a surplus of energy in fact, it consumes energy so the centre of the star becomes unstable. In just a few seconds, it suddenly collapses entirely. A wave of energy from the collapsing core blows the star apart, in the massive explosion of a supernova. Now what happens to the collapsing core of a supernova ? In the 1930s, two astronomers working in the US, Fritz Zwicky and Walter Baade, suggested that it shrank into a small ball, smaller than a white dwarf, made entirely of the subatomic particles called neutrons. In 1967 two radio astronomers at Cambridge, Tony Hewish and Jocelyn Bell, picked up regular radio signals coming from the sky. They dismissed the idea that it might be "little green men" trying to contact Earth, and realised that instead they had found some kind of natural light-house in space. Neutron stars may seem very bizarre, but theory predicts an even odder type of 'star corpse', a Black Hole. If the collapsing core of a supernova is too massive (heavier than three suns), it cannot end up as a neutron star. Its own gravity is so powerful that the core continues to shrink, until it becomes a mathematical point, with no size at all and an infinite density. Surrounding this point is a region a few kilometres across where gravity is so strong that nothing can escape, not even light. This region is a black hole. It is 'black' because even light cannot escape; and even if you tried to illuminate it, the hole would swallow up the beam from your torch. It is a 'hole' because anything you throw into it can never emerge again, however powerful the rocket engines you might strap to it. The edge of the area of space around a Black Hole where its influence is felt, is known as the Event Horizon. This is in effect the point of no return. Anything crossing the event horizon will be drawn into the Black Hole and never be able to go back. Even light crossing this boundary cannot escape the pull of intense gravity of the Black Hole. At the centre of the spherical area enclosed by the Event Horizon is the mass of the Black Hole. It is not known how big the object is, it may be anything from a few metres to less than the size of an atom. 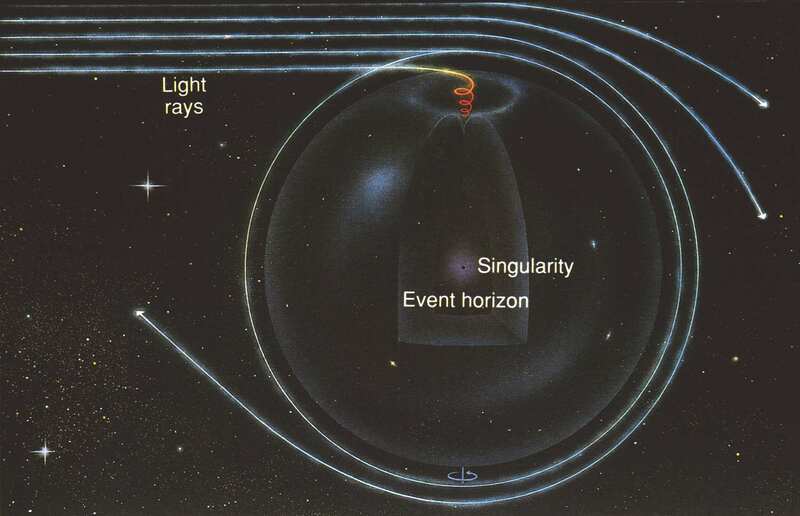 This object is also called a Singularity and is described as being a point of infinitely small size and infinite mass. All the original stuff (mass) of the star that formed the Black Hole and all the other matter it has sucked in, is still there but crushed out of normal existence. 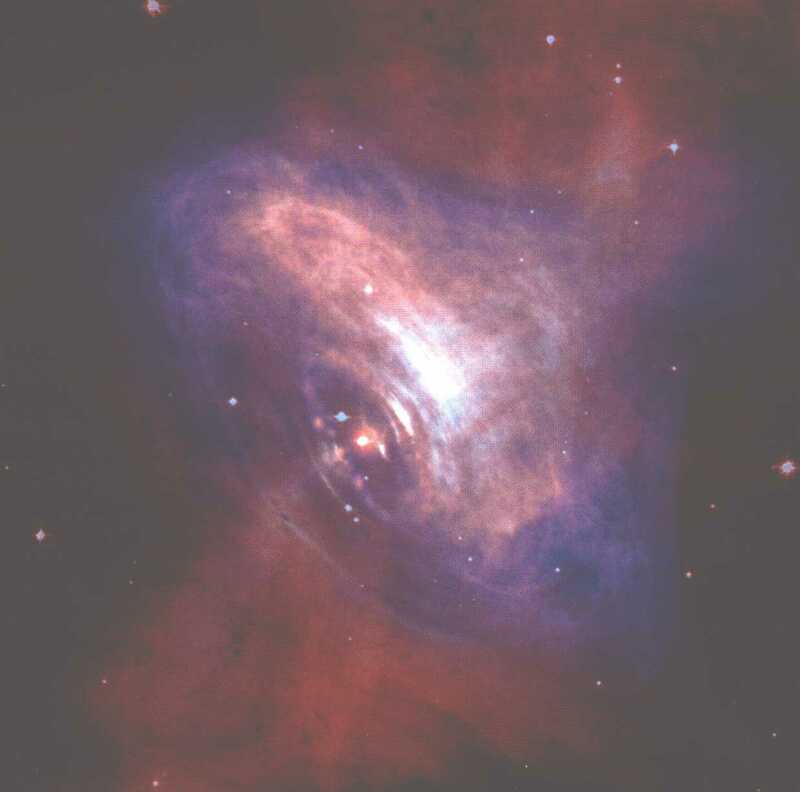 A neutron star is only about 25 kilometres across and the material inside it is so tightly packed that a pinhead of matter from a neutron star would have a mass of a million tonnes. Its gravity is so strong that an astronaut who tried to land on its surface would be crushed and spread out to form a layer only one atom thick. 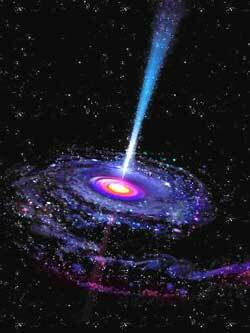 An astronaut approaching a Black Hole and passing through the event horizon would be subjected to the enormous pull of gravity. The pull on his feet would be greater than on his head so his body would begin to stretch. The gravity difference would soon become so great that his body would be torn apart and stretched out from the event horizon to the singularity at the centre. The astronaut would be stretched out like strands of spaghetti so the process is called 'Speghettifcation'. The other kind of Black Hole is found at the centre of many galaxies. These are millions or even billions of times the mass of our Sun and are so powerful that they devour whole stars. The stars are torn apart by the enormous gravity as they spiral ever faster into the Black Hole. As they disappear most of their mass is converted into X-Rays. Recent images taken by the space X-Ray telescope have shown a number of very large stars spiralling in, at enormous speeds, towards a massive object in the centre of our galaxy. This object has a mass many millions of times that of our Sun and appears to be quite small. It must therefore be a Super Massive Black Hole. The centre of our galaxy is in the direction of the constellation of Sagittarius but is obscured from the view of ordinary telescopes by huge clouds of gas and dust. Fortunately the centre of our galaxy is quiet at the moment but some galaxies have very active centres where huge numbers of stars are being destroyed by Super Massive Black Holes. Galaxies where the central black hole is devouring stars produce powerful X-Rays and develop huge jets of particles, travelling millions of light years. The existence of Black Holes has been inferred by their effect on other stars in their neighbourhood but there must be lone Black Holes with no companion. These loan Black Holes, are being sought by the way they bend light from more distant stars as the pass in front of them. A few candidates have been found but more are needed to prove they really do exist.